Discussion in 'Clarity' started by Fast Eddie B, Nov 30, 2018. Hard to read, but the result was 55.0 Ah. The vin seems to confirm it was my car's test. Coincidentally, 55.0 Ah is the value on the sample readout in the PDI. The PDI says its only an issue if the reading is below 36.6 Ah. Seems my reading is fine. Anyone else recall the reading when their PD was done? I had my dealer test mine at 3 months ownership (6 months after mfg) and it was 54.7. Based on my very limited understanding of the physics and chemistry of Lithium-ion batteries, there can be some minor fluctuations due to things like temperature. So anything very close to 55 Ah is good. My dealership practically refused to do it. Show them this Service Bulletin (17-093) that says it was supposed to be done at the pre-delivery inspection. Then demand that they either show you proof it was done or run it for you for the first time since they did not. You might also want to check that they reduced the tire pressure to 36 psi and installed the underbody noise reducing plugs. These 3 items are often left undone. My dealer did it for me during a regular maintenance session yesterday. 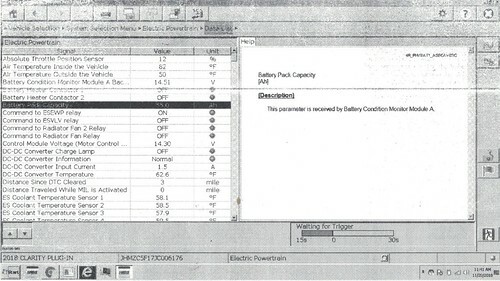 The printout show the Battery Capacity as 52.8 Ah, after exactly one full year of use. That's a little shy of Fast Eddie B's reading of 55.0, which apparently was on a new Clarity, that sounds consistent with an expected small degradation during the one year period. Actually, the PDI does NOT direct that the battery capacity measurement be done before delivery, it only indicates that this is the test for warranty replacement of the HV battery. It is listed under "This bulletin also includes this new model service information"
I went back to the SB and low and behold you’re right. It’s listed under the “New Model Service Information” that comes after the 20 step PDI. Thanks for the much needed correction. Mea culpa. It would be nice to have a benchmark so that a year from now I'll know how much the battery has degraded in a year. Do we know if this test is A Big Deal to run? I wouldn't think so . . .
Just note, that the battery capacity might not be 100% accurate, it probably depends on temperature of last charge, etc. BMW i3 has a similar metric called Batt.kapa.max, and is the cars understanding of capacity. If you read this value out it might vary by 1 or more kWh between readings. I check mine once a month on the i3 and plot vs time. If you complain they do a proper charge and discharge to check actual pack performance at a specific temperature, which often increases this value.